Melt the tab of butter and generously grease bottom and sides of muffin pan. They WILL STICK to the pan so Generous means Generous! Stir dry ingredients in a medium sized bowl and mix thoroughly with a fork. In a separate large mixing bowl, beat the milk and egg with a fork until the mixture is bubbly. About 1 minute. Gently stir in melted butter. Make sure the butter isn’t bubbling hot. You don’t want to cook the eggs. Add all the dry ingredients to the mixture. It’s important to do this all at once. Don’t add the dry ingredients one at a time to the wet ingredients. Pour batter into muffin pan. I like to use a ladle to spoon the mixture into the individual muffin forms. Fill each muffin form to about ¾ full. Stick a toothpick in the center, if it comes out clean and dry, they’re done. If not, bake for an additional 2-3 minutes until the toothpick does come out clean. Empty pan onto a clean dry cloth, or paper towel. 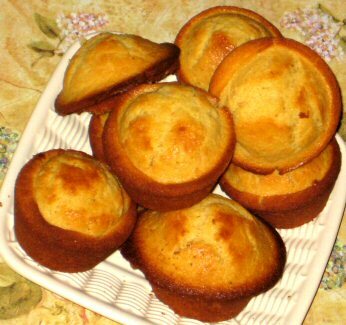 Turn muffins over onto their bottoms. Dab a small amount of butter on the tops of each muffin. Serve with any of your favorite jellies or jams. You can use a round pan, 9×1½ inches, or a square pan, 8x8x2 inches if you don’t want muffins. Consider adding 1 cup of raisins, cubed blueberries or any version of your favorite fruit. You might consider dabbing a swirl of honey on top of each muffin before putting them in the oven.